the years. He’s looking to slow down a little bit now though and this Thompson 300 will be his last one. He still has a few more events planned for later this fall though with the car now numbered as #71 [although if you look closely, there is the outline of an extra 1 after the number decal]..
Zach Sylvester had a good car in the Sunoco 300. 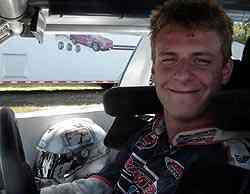 It might have even been good enough to carry him to his first career NASCAR Whelen Modified Tour victory. However, with just 14 laps to go, it went from one quick enough to be running in the lead pack, to one that was coasting into the pit area with ignition problems. Many people were talking after the Sunoco 300 at Thompson about two young drivers who went too far with each other on the racetrack. The feel-good story of the day thought was just the opposite. It was of ageless (actually 60-something) Bob Polverari, finishing the race in the eighth position. 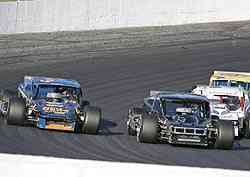 Polverari had a lot of fun racing against the guys on the NASCAR Whelen Modified Tour at Thompson. On a day where teams tried all kinds of different strategies, Sylvester was very happy to the approach to the race that his #15 team took. As usual, Sylvester was smiling after the race. He’s the kind of guy who always seems to find the positive in anything that happens on the racetrack. But if you looked close, you could see that his smile was a little bit dimmer than usual and that this DNF really hurt a lot. 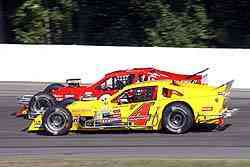 Eddie Flemke won the Thompson 300 last season. It was one of his two victories last year as he rode to the runner-up spot in the standings. This year has been a little bit tougher for Flemke. His #10 Gary Teto-team has shown plenty of promise, and probably more heart than any team out there, but has been struck down by bad luck time and time again. So when the team was able to walk away from the 2005 running of the 300, they were very satisfied. 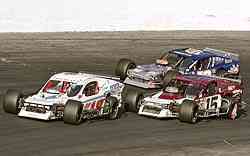 Getting to the finish was a little more complicated that most Modified races. “We just had to be very patient. The track built up a lot of rubber and that made for a handling nightmare. That’s why there was so much lane changing and aggression out there. We stuck to our gameplan. We pitted a little early and put two tires on. In the Tour’s last event at Martinsville, Flemke also had a car that was running towards the front, but he dropped out of the race early when a wheel came off his car. This week, everything stayed where it was supposed to. Eric Beers led most of the final 100 laps, but with 30 to go his tires gave up their grip and it was like flipping a switch. He dropped out of the lead and back through the field when that happened. The fact that Beers ran for so long on that set of tires was not something that he planned. His team has hoped for a caution to put on fresh rubber to get him through the late stages of the race, but when the race had a long green run, his plan instantly soured. pitted with only 11 laps to go – and he passed enough cars before the end of the race to end up finishing 10th. 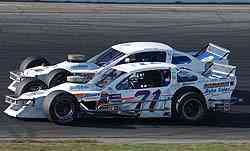 We restarted 15th or 16th and within a few laps, we were up to 10th,” said Beers. Tyler Haydt finished 12th at Thompson. On the surface, that might sound respectable, but not great. After all, he finished in the top 10 at the track in April’s Icebreaker and that was his first ever NASCAR Whelen Modified Tour start. But 12th was pretty remarkable when you looked at Haydt’s progress through the 300 weekend. His #28 was far off in qualifying and early in the race, he struggled to stay on the lead lap. He lost that battle eventually, but made that into a positive when he tucked in behind early leader Jerry Marquis and shadowed him around the track, learning something each lap. Haydt was asked about following Marquis and the young driver talked about how that helped him so much. Haydt is also very thankful that he has a strong car, the #28 owned by Don King, and a good team of crew members behind him. Those two things helped him stay patient and finish the longest Modified race of the season. 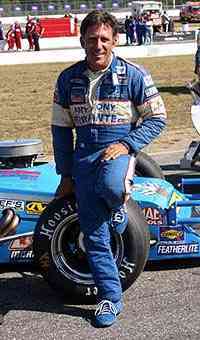 Tony Ferrante finished seventh in the Sunoco 300 at Thompson and it was one of his most solid runs during a partial season of racing in 2005. Ferrante is considering retirement at the conclusion of the season and this might have been his final 300. Speed51.com asked him directly if he thinks that will be the case. We got a little bit of a mixed answer. Tony Hirschman is no stranger to winning at Thompson, this time though he came up just a little bit short in second-place. Hirschman isn’t down about that fact though. He’s just looking ahead to the two more times that the Modified Tour visits the Connecticut track before the end of the season. Jerry Marquis had a monster lead early in the Sunoco 300. Then he fell back after pit stops. The he recovered to finish fourth. “It was back and forth all the way around,” said Marquis. “We almost went a lap down and we got fourth out of it. We started fourth and finished fourth. We came out of here in one piece, so I’m happy about it. laps and 17 cars [on the lead lap], there’s no way that we would have gained that many positions [by pitting late]. Marquis is trying to make up ground in the championship fight and has been catching point leaders Ted Christopher and Tony Hirschman all summer. But, a solid fourth place finish does not help much though when the two point leaders finish first and second though. The Sunoco 300 at Thompson is a long race and with only seven caution periods over 300 laps, this year’s running was especially grueling. It didn’t matter if you were old or young. Young bones didn’t help much though.